Back in July 2014, a Taiwanese multinational computer and electronics company, ASUS launched its mobile phones in India. They named it Zenfone with the tagline ' In search of the incredible'. Not only that, they got heartthrob Arjun kapoor to launch it! There were a series of phones with sleek design and amazing interface and functions. I had been tempted to try it but since I had recently purchased an expensive smartphone, I could not. 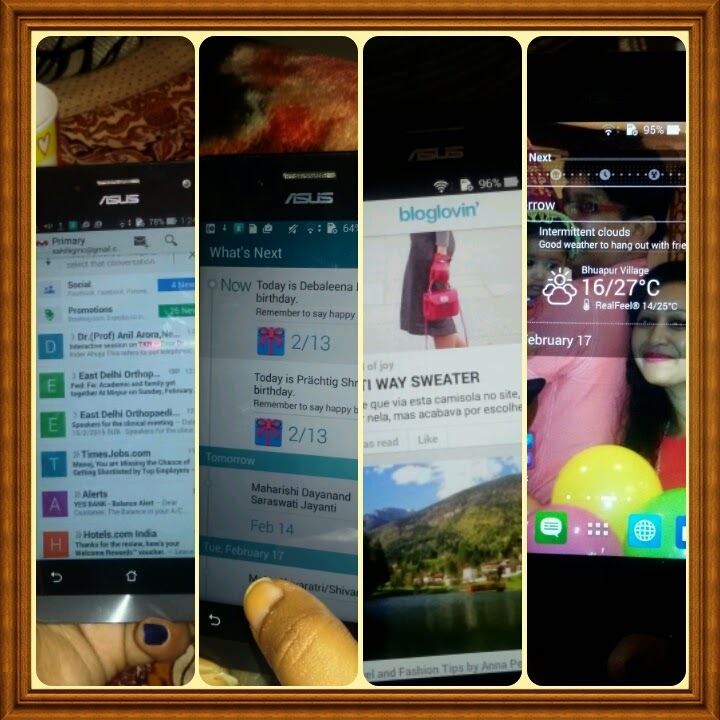 So when I got the oppurtunity to use the ASUS Zenfone 5 for a week, my joy knew no bounds. I can't wait to share the details of my experience! This is technically the first tech review for me so cheers to new things!! I am an Android user since long and Zenfone 5 is a fabulous Android smartphone. It is powered with Android v 4.3 (Jelly bean) which is upgradable to v 4.4 KitKat OS. It is such a sleek phone! I got it in white and loved the 5inch IPS display with 1280*780 p resolution. Here is to how it helped me to spend a great at work! My typical workday usually starts at 7 in the morning ( if I don't have to drop my daughter at my mom's) otherwise earlier! The first thing I do after waking up is I check my to do list, emails and blogger dashboard. With my Zenfone5 I can do it in the comfort of the warmth of my bed. My Zenfone has 1.6 Ghz Intel dual core processor and power vr GPU with a 2 GB RAM which makes multitasking very easy. Google Chrome runs really fast and so I don't have any excuse to linger in my bed. After a quick trip to the kitchen for breakfast and lunch packing, I get ready. Often I consult my smartphone for quick recipes but today I was running late. So after a quick shower, I left for the hospital in helter skelter. Me at my chamber in the Out Patient Department. 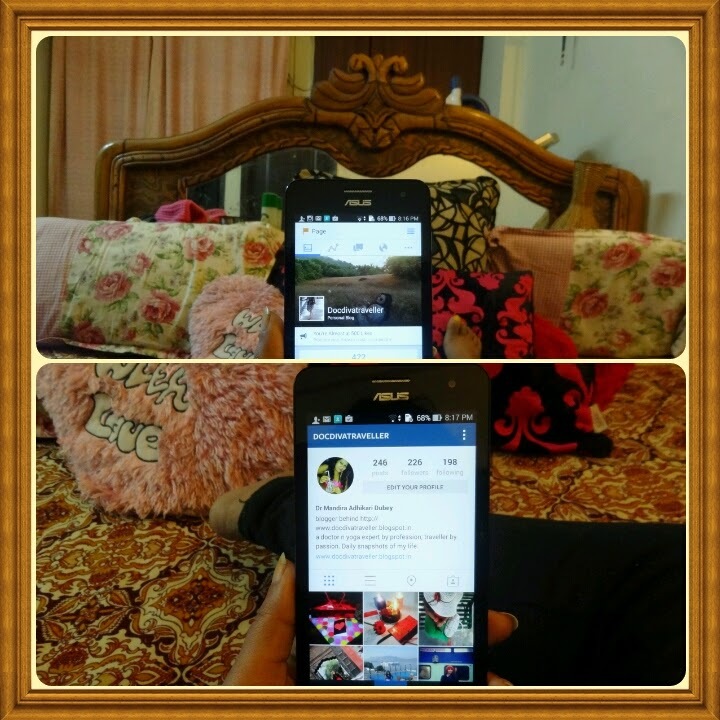 My Dual Sim Zenfone 5 helps to separate my work from my personal life. My day at the hospital started with OPD consultation. I usually have to give my phone number to my patients so I need a Dual sim phone. My Zenfone very easily handles two GSM sims without having to carry two phones. This is how I separate my personal life from work. Also it provides excellent signal reception, thanks to its advanced antenna design. I could talk smoothly in elevators and basement too. My Zenfone 5 helps me take excellent pictures of the MRI and X Ray films. I usually take pictures of the MRI and Xray films of my patients. It helps me to document my work and keep a tab of their progress. For that I need a camera with excellent clarity. Usually I carry my digital camera but today I did not. I had my Zenfone5 with me. One of the best features of the Zenfone 5 is its 8MP rear camera. It's infused with ASUS's unique Pixelmaster technology which combines five brightness enhancing lenses to achieve perfect photos. It takes superb pictures in low light too!! I took sharp quality images of the MRI and Xray films. My Zenfone 5 acts as a remote and I control my PC with it for a flawless presentation. Today in the afternoon I had a presentation. My Zenphone helped me in that too. I used it as a remote to change the slides. With its Zen link, it helps to connect my phone with my laptop. The Remote link helps my phone to become a remote control! I could control my laptop with my Zenfone's touchscreen and deliver presentations like Past master! Cheers to Zenfone5 for a seamless presentation. Often I have to take calls during wound dressing and the nurse holds the phone to my ear. Most of the time the phone slips or gets scratches due to man handling. The thing which which I loved most about my Zenfone5 is its impressive touch responsiveness with a response time of 60ms. Also it has an antifingerprint coating to prevent smudges. Its so sensitive that I can used wearing gloves!! I no more need someone else to hold my phone when I am wearing one! Also its Corning Gorilla Glass3 protects it from scratches and accidental screen damages. After a hectic day at the hospital I love to unwind through blogging and net surfing. I am often too tired to switch on my laptop and hence do it on my phone. The ZenUI is exclusively designed to meet my needs. I can multitask seamlessly without any lags. My typical activities include upating my social media like facebook page and Instagram ( my favourite app). One time I am doing this and then suddenly I am checking my mail and then my blogger dashboard. The blogs which I read everyday have impressive visual clarity, beautiful colours and quality pictures, thanks to ASUS TruVivid technology. Heavy web pages can be browsed effortlessly and I am able to multitask absolutely flawlessly. My zenfone operates as fast as my laptop! Moreover with its Pixelmaster photographs, I am now updating my Instagram more frequently with my daily knicknacks. Checking my Email, what's next and to do list, reading my favourite blogs through Bloglovin App and of course checking out tomorrow's climate ....all in the comfort of my bed. My day ended with listening to FM radio on my Zenfone till I doze off. The ASUS Golden ear team has done a great job with the SonicMaster technology to deliver an incredible sound experience! Here's to a fruitfulday thanks to my Zenfone5! I was super excited when the package arrived and the Zenfone lived up more than my expectations. More of my incredible experiences with my Zenphone5 coming soon!! Stay tuned!! Great job and is good to document your work and check your agenda for the following day excellent presentation. You look beautiful at work!! Great pictures! I just love the phones from ASUS. Their Zen series is awesome. Great review and lovely pictures. Seems like it has been very helpful for you. It was so nice seeing you at your workplace. WOW..loved the phone. u seemed to have used it pretty well.